Under the Cupola: I'm a knitter, live with it. This darling is finished. Or, frankly, almost finished. I ran out of yarn halfway through the last row and I'm not ripping anything to shorten it by a few rows to have enough. No, I don't have more of that yarn, it was the only skein. I have something similar used way up in the sweater at home II. 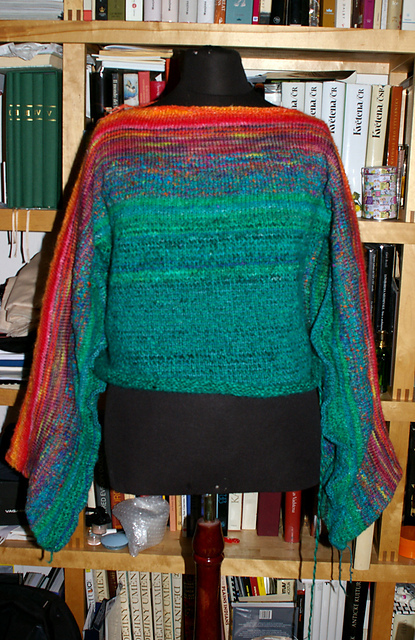 so it will take a while but I consider the sweater finished. The picture was taken three skeins ago, on Sunday morning. At a certain point, I decided to bite it and I'm taking my knitting downstairs to work on it while watching telly and there was some downhill skiing and stuff. The Eurosport channel is much more fun in winter and no, I don't like football. I do tolerate tennis but my mom is working hard in disgusting it to me. Anyway, now I need to find something in mild progress so that there would be idiotic knitting enough to go on and on and on while House M. D. is being mean, or something like that. Or maybe I should start working on those 10 pages I should have written by tomorrow noon. That's probably a way to go.